I am just wondering which miracle I should write, because I new when there was a day when I was not having money to do my 10+2. Also I didn't know what is going to happen the next day. Now I have completed my engineering and I am in USA as a software engineer. Every day of my life and every phase of my life are being taken care by Sai Baba. In fact for me Sai Baba is my father and Dwarkamai is my mother that’s how I feel and that’s how I address Baba and Dwarkamai. I have seen every statement of Baba true in my life in fact some times when I slide out of the spiritual path may be due to my weaknesses or may be due to the situations. When again I come back to the path shown by Baba for His children and then I feel I have done something against what Baba said and I think Baba might be angry with me. Then I look into Him and I get the statement in my mind can a mother get angry with her kiddies will the ocean send back the rivers. I see the photograph of Sai Baba and I feel that he saying me these lines I feel like watching him endlessly in fact He is the Master of the world. I feel like writing every experience of mine, but I feel its going to become lengthy may be I will get a chance to write and tell the world all my experiences. WISH THE WORLD UNENDING BLISS AND MAY EVERY ONE IN THE WORLD REALIZE THE LORD SAI BABA, I WISH EVERY ONE A HAPPY AND PEACEFUL LIFE. THANK YOU FOR GIVING ME AN OPPORTUNITY TO EXPRESS MY SELF. I really do not have any words to praise the Lord Shirdi Sairam. Today I am working in a Good company and in the abroad means it is all the blessings of Sai Baba. So every day I start work by chanting OM SAI SRI SAI JAYA JAYA SHIRDI SAI. Believe it or not all the ups and downs during the day while executing the work are beared by God. I am simply executing what Baba says to me. In the end the result was simply great. I felt that this way doing the work gives a great relief from the work load. have succeeded in my career with the help of my Sai. I remember the day - no job, no money, no love and I was fully depressed and filled with tears. My Sai helped me at this stage and now I am abroad working as software professional with all the things I need and also more. I used to visit Sai Baba’s temple occasionally during 1993-95. Later I did my B.Tech during 95-99 and then to do pursue higher education. I appeared for the entrance examination and though I fared well I was unable to get a seat in the colleges I wanted. Till 1999 July I didn’t know much about Baba, I was very much distressed at that time, then in the month of august somehow two books written on Baba came to me. I started reading the books (one of them is Satcharitra) and then the magic of Baba started to work on me, whereever I go he used to follow me. Whether I am in a bus or an auto, where ever I concentrate he is present there as if he is calling me, he never left me alone. So my attachment with him grew bigger and bigger, then in year 2000 I got admission in M.Tech in IIT Bombay with His blessings, and I visited Shirdi thrice during my stay in Bombay. And even today He follows me and takes care of me , I daily read Sai Satcharitra and every time I read it I find something new to follow, every where I find his presence, when ever i am in need of help he provides me the same. There are a lot of miracles he had done for me but it will take a lot of space and time to describe them, only thing I can say is that he will never forget us even if we forget him. looking to be back to home. Today again I am looking to Baba for the Guidence and future. Baba thank you very much for giving me a job. In fact, you have given me several job opportunities from which you have chosen one for me. Thanks for fulfilling my wish. You asked me to wait with 2 paise dakshina (shradha, saburi) and there you go, I got the result. I sincerely ask all devotees to have shradha, saburi and wait for his blessings even if it takes years. May Baba bless all of us. I was asking baba this morning to show me a way I should go, I wanted to know if there are incidents where people like me can really do certain thinks that seem impossible. And here is the answer that Baba gave me in all the leelas that you wrote. They gave me the confidance I need. Thank you very much. Baba's ways are so different, Thank you Baba. Baba now please be with me while I move forward, and put me back on your path. OMSAIRAM!Praveen ji & Maithili ji,IT's ALL BABA'S LEELA. I just became a medium . BABA wanted to drill into our minds of the currency of 2 paisa SS(SHRADDHA & SABURI). 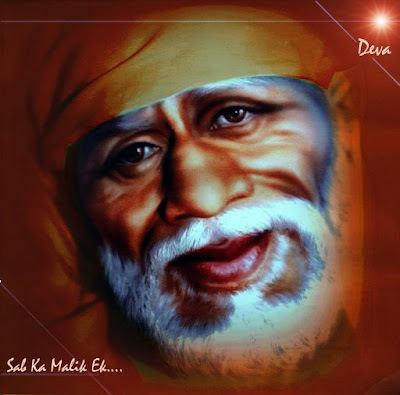 I LOVE YOU SAI BABA ! You are really doing a wonderful job ... you are bringing into awareness about baba's leelas . Infact you have even suggested me about His udi and SSC . May god bless you !!!!! He passed away without seeing his name in the Guinness Book of Records. Pt Razdan holds the credit for having written and composed the greatest number of bhajans on one subject - Sai Baba. He has 13 cassettes with various music companies who have released his work. So popular are they that different religious organizations have pinched his work and it has been passed off as theirs. Pt Razdan, who passed away recently on the 1st of November, was a Sai bhakt and he had an interesting story to his faith in the Saint of Shirdi. For him writing bhajans was almost a calling. He started life 50 years ago as a fledgling journalist writing about films. Somewhere in the middle of a lucrative career he decided to make a film. He signed Rajkumar - always a difficult star. After recording eight songs and completing a few shooting schedules, he ran into trouble causing him huge losses in money and more importantly in spirits. This was when he began realizing the futility of life and the temporariness of relationships. He said in a nostalgic moment, "My wife was an avid Sai Bhakt but I had never thought of these things. I came from a family of doctors and had never even visited Shirdi. One day though as I was driving in my car I suddenly started humming quite naturally - the words 'jis haal main rakhe Sai us haal main rehte jao…' these words and the tune came to me quite spontaneously. I reached home and put down the words and as I knew nothing about music composition, I recorded the bhajan to remember it. This was in 1977. There used to be a satsang in my mother-in-law's house on Mondays and Thursdays and I used to often sing there. People started enjoying my compositions and requesting me to sing my own bhajans like 'dheeraj rakh, who rehmat ki barkha barsa hi dega..jis Sai ne dard diya hai who dava bhi dega." Then we went to this room we saw a man who was seven feet tall and 127 years old. He asked me about myself and I told him. He asked to hear my bhajans and then asked what I wanted to do. I said that I'd like these bhajans recorded. He gave me five things - an apple, a bottle of perfume a towel, a banana and an orange. He blessed us and we left. Outside a man told us that this Rambaba had met Sai Baba in 1910, 1914 and 1915 and was a great devotee. He was surprised that Rambaba had given us so much importance. This was in February 1984. This is when my career in music started off. In 1984 I recorded by first album Sai Yatra. I spent my own money but got great pleasure in doing so. In 1986, I recorded Sai Arpan in the voice of Manhar Udhas…" this kicked off an association which lasted till his death. Razdan's intention was to record 18 albums like the 18 chapters of the Bhagvad Gita. He said that his albums fared so well because he talked about the teachings of Baba and not just repeating the name of the Saint as others do. Listeners have often claimed that they find solutions to their problems merely by listening to his bhajans. Companies like CBS, Times, Music Polygram and T series have recorded his albums. Maestros like Naushad Ali have appreciated his work. He had 11 bhajans in blank verse ready to record his next album. It remains to be seen how this will be done. So great was his faith that after the debacle of the film, money started pouring in again and his faith in Sai made him say 'andheron se ab dar nahin lagta, ik Deepak jala diya maine'. There was a gentleman by name Harishchandra Pital in Bombay. He had a son, who suffered from epilepsy. He tried many allopathic and ayurvedic doctors, but there was no cure. There remained only one way of remedy, viz. resorting to the saints. It has been stated in Chapter XV that Das Ganu by his inimitable and splendid kirtans spread the fame of Sai Baba in the Bombay Presidency. Mr. Pitale heard some of these kirtans in 1910 and learnt therefrom and from others that Baba, by His touch and mere glance, cured many incurable diseases. Then a desire arose in his mind to see Sai Baba. Making all preparations and taking presents and fruit-baskets, Mr. Pitale came to Shirdi with family, wife and children. He then went to the Masjid with them, prostrated before Baba and placed his sick son on Baba's Feet. No sooner Baba saw the child than an untoward thing happened. The son immediately revolved his eyes and fell down senseless. His mouth began to foam and his whole body began to perspire profusely and it seemed as if he breathed himself out. Seeing this, the parents became very nervous and excited. The boy used to get such fits very often, but this fit seemed to persist long. Tears began to flow ceaselessly from the mother's eyes and she began to wail, crying that her condition was like that of a person, who being afraid of the robbers ran into a house which collapsed on him,or like a cow fearing a tiger, ran into the hands of a butcher, or like a traveller, who being tormented by the heat of the sun went to take refuge under a tree, which fell upon him, or like a devout person going for worship into a temple which collapsed upon him. Then Baba comforted her saying - "Do not wail like this, wait a bit, have patience, take the boy to your lodging, he will come to his senses within half an hour." They did as directed by Baba and found that His words came true. As soon as he was taken into the Wada, the boy recovered and all the Pitale family, husband, wife and others were very delighted and all their doubts disappeared. Then Mr. Pitale came with his wife to see Baba and prostrated himself before Him very humbly and respectfully and sat shampooing His legs and mentally thanking Baba for His help. Baba then smilingly said - "Are not all your thoughts, doubts and apprehensions calmed down now? Hari (Lord) will protect him, who has got faith and patience". Mr. Pitale was a rich and well-to-do gentleman. He distributed sweet-meat on a large scale and gave Baba excellent fruits and pan (betel-leaves). Mrs. Pitale was a very Sattwik lady, simple, loving and faithful. She used to sit near the post staring at Baba with tears of joy flowing down from her eyes. Seeing her of an amicable and loving nature, Baba was much pleased with her. Like Gods, Saints are always dependent on their devotees who surrender and worship them with their heart and soul. After passing some happy days in Baba's company, the Pitale family came to the Masjid to take Baba's leave to depart. Baba gave them Udi and blessings and called Mr. Pitale close by and said to him - "Bapu, I had given you before, Rs. two, now I give you Rs. three; keep these in your shrine for worship and you will be benefited." Mr. Pitale accepted these as Prasad, prostrated himself again before Baba and prayed for His blessings. A thought arose in his mind, that as that was his first trip to Shirdi, he could not understand what Baba meant, when He said that He had given Rs. two previously. He was curious to have this mystery solves, but Baba kept silent. When Mr. Pitale returned to Bombay, he narrated to his old mother all that had happened at Shirdi and the mystery about Baba's giving him Rs. two formerly. The mother also did not understand the mystery, but, thinking seriously about that, she was reminded of an old incident, which solved the mystery. She said to her son - "As you now went to Sai Baba with your son, so had your father done when he took you to Akkalkot, for the darshana of the Maharaj there many years ago. That Maharaj was also a Siddha, Perfect Yogi, omniscient and liberal. Your father was pure, devout and his worship was accepted. He then gave your father Rs. two for being kept in the shrine and worshipped. Your father worshipped them accordingly till his death, but thereafter the worship was neglected and the rupees were lost. After some years the memory of these two rupees also disappeared and now, as you are very fortunate, the Akkalkotkar Maharaj has appeared to you in the form of Sai Baba just to remind you to your duties and worship, and to ward off all dangers. Now beware henceforth, leave off all doubts and bad thoughts, follow your ancestors and behave well; go on worshipping the family gods and the rupees, appraise properly and take pride in the blessing of the Saints. Sai Samartha has kindly revived the spirit of Bhakti in you, cultivate it it your benefit." Hearing the remarks of the mother, Mr. Pitale was very much delighted. He came to know, and was convinced about the all-prevasiveness of Baba and the significance of His darshan. From that time he became very careful about his behaviour. Mr. Sapatneker of Akkalkot (Sholapur District) was studying for law. A co-student Mr.Shevade met him. Other fellow students also gathered together and compared notes of their study. It was found by the questions and answers amongst themselves, that Mr.Shevade was the least prepared of all for the examination, and therefore all the students derided him. But he said that though he was not prepared, he was sure to pass the examination, as his Sai Baba was there to get him through it successfully. Mr.Sapatnekar was surprised at this remark. He took Mr.Shevade aside and asked him who this Sai Baba was whom he extolled so high. He replied - "There lives in a Masjid in Shirdi (Ahmednagar District) a fakir. He is a great Sat-purusha. There may be other saints, but this is unique. Unless there is a great store of merits on one's account, one can't see Him. I fully believe in Him, and what He says will be never untrue. He has assured me that I will pass definitely next year and I am confident that I will get through the final examination also with His grace." Mr.Sapatneker laughed at his friend's confidence and jeered at him and Baba. Mr.Sapatnekar passed his examination, settled at Akkalkot and practised as a pleader there. Ten years after this, i.e., in 1913 he lost his only son on account of a throat disease. This broke his heart. He sought relief by making a pilgrimage to Pandharpur, Ganagapur and other holy places. He got no peace of mind. Then he read Vedanta, which also did not help him. In the meanwhile he remembered Mr.Shevade's remarks and his faith in Baba, and he thought that he too should go to Shirdi and see Baba. He went to Shirdi with his younger brother Panditrao and was much pleased to see Baba from a distance. When he went near and prostrated himself and placed a coconut before Baba with pure feeling (devotion), the latter at once cried out "Get away." Saptnekar hung down his head, moved back and sat aside. He wanted to consult somebody who would advise him how to proceed. Somebody mentioned Bala Shimpi's name. Sapatnekar saw him and sought his help. They bought Baba's photos and came with them to the Masjid. Baba Shimpi took a photo in his hand, gave it to Baba and asked him whose photo it was. Baba said that this photo was the 'Yara' (Lover) of him, pointing to Sapatnekar. Saying this Baba laughed and all others joined. Bala asked Baba the significance of the laugh and beckoned Sapatnekar to come forward and take darshan. When Saptnakar began to prostrate himself, Baba again cried "Get out." Sapatnekar did not know what to do. Then they both joined their hands and sat before Baba, praying. Baba finally ordered sapatnekar to clear out immediately. Both were sad and dejected. As Baba's order had to be obeyed, Sapatnekar left Shirdi with a heavy heart praying that he should be allowed to take darshan next time. One year elapsed. Still his mind was not at peace. He went to Gangapur, where he felt more restless. Then he went to Madhegaon for rest and finally decided to go to Kashi. Two days before starting, his wife got a vision. In her dream she was going with a pitcher to Lakadsha's well. There a fakir with a piece of cloth round his head, who was sitting at the foot of the Neem tree, came close to her and said - "My dear lassie, why get exhausted for nothing? I get your pitcher filled with pure water." She was afraid of the fakir and hastened back with the empty pitcher. The fakir followed her. At this she was awakened and opened her eyes. She told this vision to her husband. They thought that this was an auspicious sign and they both left for Shirdi. When they reached the Masjid, Baba was absent. He had gone to Lendi. They waited till His return. When He returned, she was surprised to see that the fakir she saw in her vision, resembled exactly Baba. She reverentially prostrated herself before Baba and sat looking at him. Seeing her humility Baba was much pleased and began to tell a story in his peculiar characteristic fashion to a third party. He said - "My arms, abdomen and waist are paining for a long time. I took many medicines, the pains did not abate. I got sick of the medicines as they gave me no relief, but I am surprised to see now that all the pains have disappeared at once." Though no name was mentioned it was the story of Mrs.Sapatnekar herself. Her pains, as described by Baba, left her soon and she was happy. Then Mr.Sapatnekar went ahead to take darshan. He was again welcomed with the former "Get out." This time he was more penitent and persevering. He said that Baba's displeasure was due to his past deeds and resolved to make amends for the same. He determined to see Baba alone and ask his pardon for his past actions. This he did. He placed his head on Baba's feet and Baba placed His hand on it and Sapatnekar sat stroking Baba's leg. Then a shepherdess came and sat massaging Baba's waist. Baba in his characteristic way began to tell the story of a bania. He related the various vicissitudes of all his life, including the death of his only son. Sapatnekar was surprised to see that the story which Baba related was his own, and he wondered how Baba knew every detail of it. He came to know that He was omniscient and knew the hearts of all. When this thought crossed his mind, Baba still addressing the shepherdess and pointing to Sapatnekar said - "This fellow blames Me and charges Me with killing his son. Do I kill people's children? Why does this fellow come to the Masjid and cry? Now I will do this I will again bring that very child back in his wife's womb." WIth these words He placed His blessing and on his head and comforted him saying - "These feet are old and holy, you are care-free now; place entire faith in Me and you will soon get your object." Sapatnekar was much moved with emotion, he bathed Baba's feet with his tears and then returned to his residence. Then he made preparations of worship and naivedya and came with his wife to the Masjid. He offered all this to Baba daily and accepted prasad from Him. There was a crowd in the Masjid and Sapatnekar went there and saluted Baba again and again. Seeing heads clashing against heads Baba said to Sapatnekar - "Oh, why do you prostrate yourself now and then? The one Namaskar offered with love and humility is enough." Then Sapatnekar witnessed that night the chavadi procession described before. In that procession Baba looked like a veritable Pandurang (Vithal). At parting next day, Sapatnekar thought that he should first pay one rupee as dakshina and if Baba asked again, instead of saying no, he should pay one more, reserving with him sufficient amount as expenses for the journey. When he went to the Masjid and offered one rupee, Baba asked for another as per his intention and when it was paid, Baba blessed him him saying - "Take the coconut, put it in your wife's oti (upper fold of her sari), and go away at ease without the least anxiety." 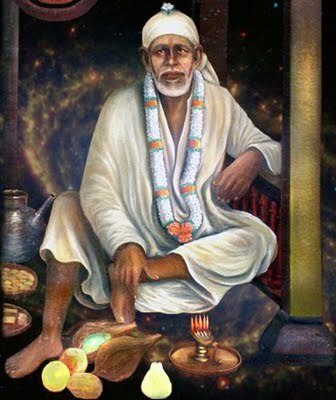 He did so, and within a year a son was born to him and with an infant of 8 months the pair came to Shirdi, placed it at Baba's feet and prayed thus - "Oh, Sainath, we do not know how to redeem Your obligations, therefore we prostrate ourselves before You, bless us poor helpless fellows, henceforth let Your holy feet be our sole refuge. Many thoughts and ideas trouble us in waking and dream states, so turn away our minds from them to Your bhajan and bless us." The son was named Murlidhar. Two others (Bhaskar and Dinkar) were born afterwards. The Sapatnekar pair thus realized that Baba's words were never untrue and unfulfilled, but turned out literally true. It was on 3rd February 1998. I was about to complete an article on Sai Baba. I heard a sharp rap at the gate of my house. I shouted; who is there?” Promptly the reply came: "Khaana Lav" (give me food). From where I sat, I could not see him. Nevertheless, I called my wife to serve food to him. She bought rice and dhal but oddly, he did not have anything on him to receive it. My wife did not feel like serving in the plate she brought. So she came back to the house, took a small cardboard and served the fare on it outside the gate. He sat on his haunches preparatory to eating. Meanwhile, my wife came inside to fetch water for him. It did not take a couple of minutes for her to do so. But the stranger was not to be seen anywhere. There were telltale marks of his having taken the food. He did not even wash his hands. It was impossible to eat the food, that too without water, and walk away out of sight in less than a couple of minutes. It was then the truth hit me like a whiplash. I should have known much better when he said, "Khaana laav". It was truly a command. Even during his begging rounds sometimes, Sai Baba never begged. He simply commanded, "Lassie, roti laav". I asked my wife as to how he looked like. She said, "He was lean aged and looked like a village Muslim of the old order, with a sharp beard. He was wearing a faded green lungi with brownish checks on it and a soiled white long-sleeved kurtha with a black vest on it. His head was turbaned leaving the top crown open". Though the description did not actually tally with that of Sai Baba, I was by then more than convinced who He was. I cursed myself because the food that was served was overnight food and served on cardboard outside the gate. Later when I slowly composed myself, I went into the pooja room and begged His pardon for my lapse. At that stage my own conscience began to reply, "Your repentance is enough for me. Keep on feeding the hungry, who come to your doorstep, as best as you can. Believe me, charity especially that of food, is indeed a great spiritual virtue"
Page created in 0.283 seconds with 69 queries.